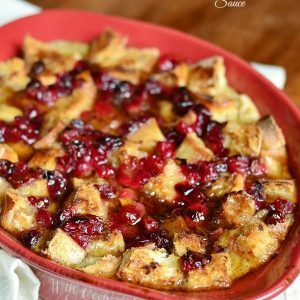 This Cranberry Bread Pudding with Honey Whiskey Maple Sauce would make an amazing holiday breakfast or even a dessert, if served with a scoop of ice cream. Made with fresh cranberries that were first cooked with brown sugar and topped with an easy honey whiskey maple sauce. Do you ever get so hung up on deciding what to make for the holiday dinner that you completely forget to plan breakfast? Because I totally do that. I can spend weeks planning and preparing for the holiday dinners and not even think about breakfast. Breakfast on holidays is very important though, especially if you have out of town family coming and staying through the holidays. 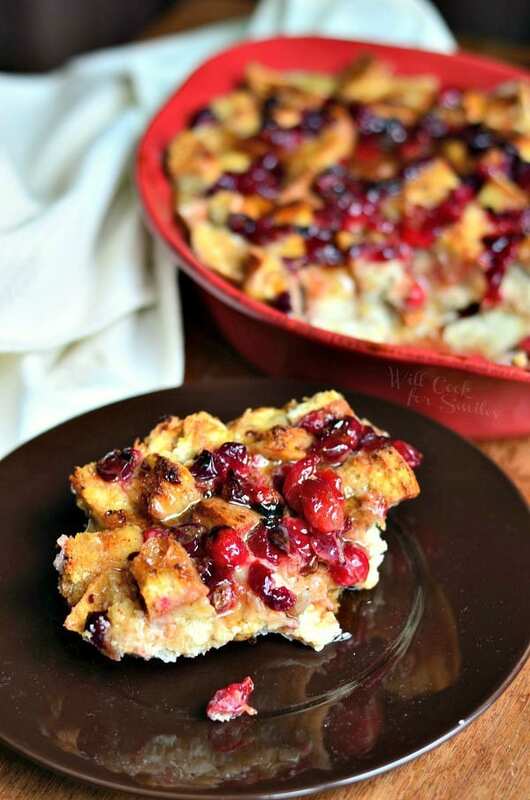 This Cranberry Bread Pudding would make a fantastic breakfast! I know what you are thinking, can it be prepared the night before? 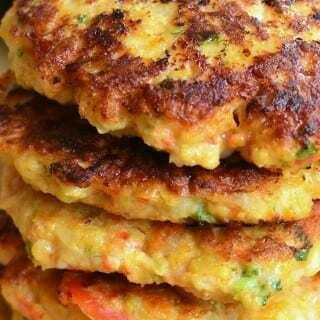 The answer is “yes, it can.” It can be prepared in the evening, covered and refrigerated OR it can be made right in the morning. I’ve made it both ways and it comes out great each time. The only thing to consider is to leave bread out to let it get stale and use a more dense bread. 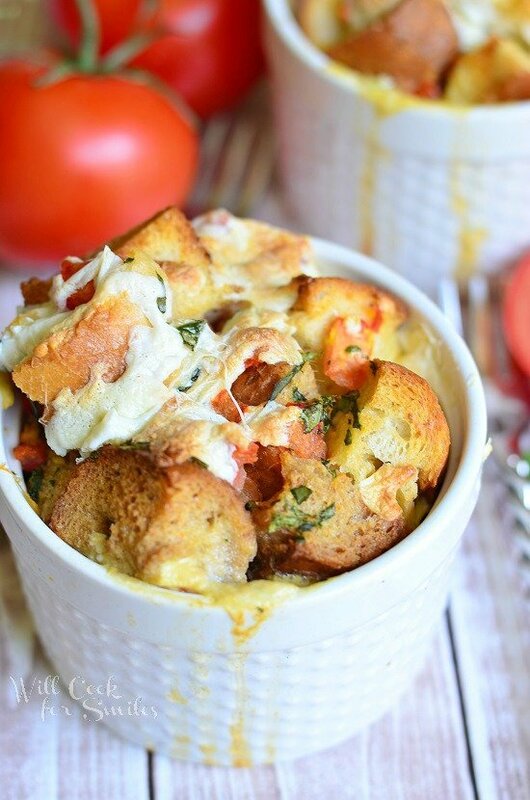 I absolutely love the flavor combination in this bread pudding. 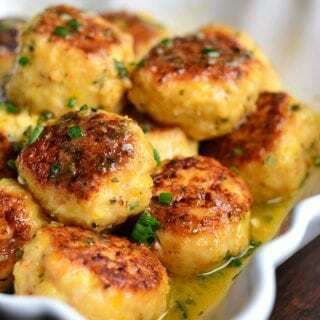 Pop of flavor from fresh cranberries and the sauce is what I particularly enjoy in this dish. 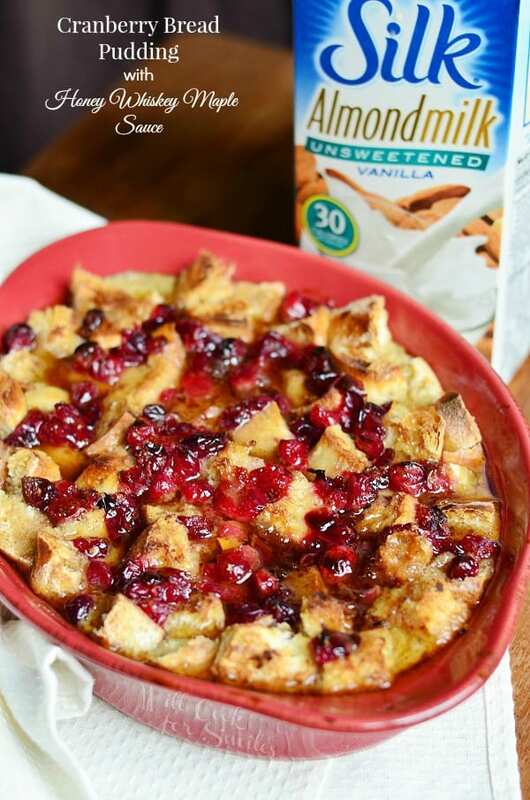 Don’t worry, cranberries are first cooked with some brown sugar to give it sweetness and take out some of the bitterness and then added to bread pudding. 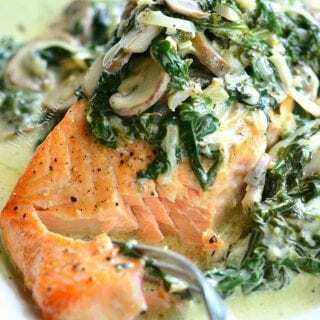 The sauce is very simple but it compliments the whole dish amazingly. Made with fresh cranberries that were first cooked with brown sugar and topped with an easy honey whiskey maple sauce. Make sure you cut up your bread into ½-inch cubes and lay them out to get stale ahead of time. In a medium mixing bowl, whisk eggs, Silk, butter, vanilla extract, allspice and sugar together until smooth. Carefully stir in cranberry mixture. Lightly grease a 2-quart, wide pan (or like a 9×9 baking pan) and spread bread evenly. Pour egg mixture over the bread, making sure berries are spread as evenly as you can. Press lightly and put in the oven. 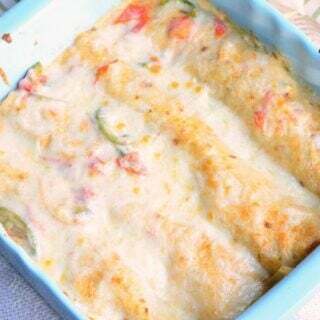 Bake for 35-45 minutes at 400 degrees. You can check for doneness by touching in the center, if it feels dense and firm, the eggs are cooked. Sauce: Preheat a small sauce pot over medium heat and add whiskey. Simmer for a few minutes to let alcohol cook out. Add maple syrup and cinnamon. Stir well and cook for a couple more minutes. 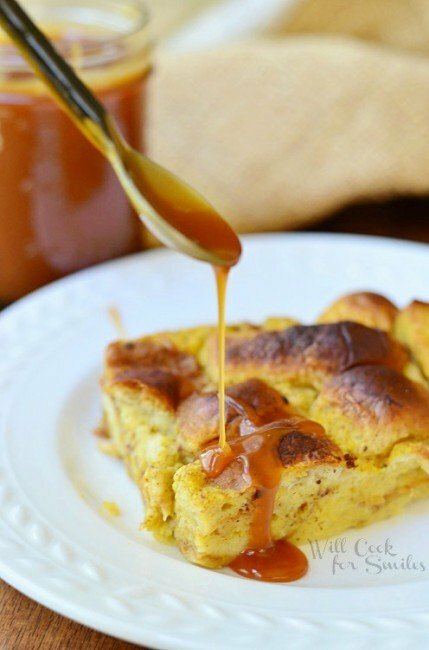 Pour sauce over bread pudding. Lovely pictures as usual and a great idea for an unusual breakfast! Oh WOW! This not only looks spectacular, it sounds amazing!! How large are your baguettes? My store offers many sizes…. Or, better yet.. about how many cups of bread cubes did yours yield once cut up? Kelsey, that’s a good point, my baguette was about 8-10 oz. 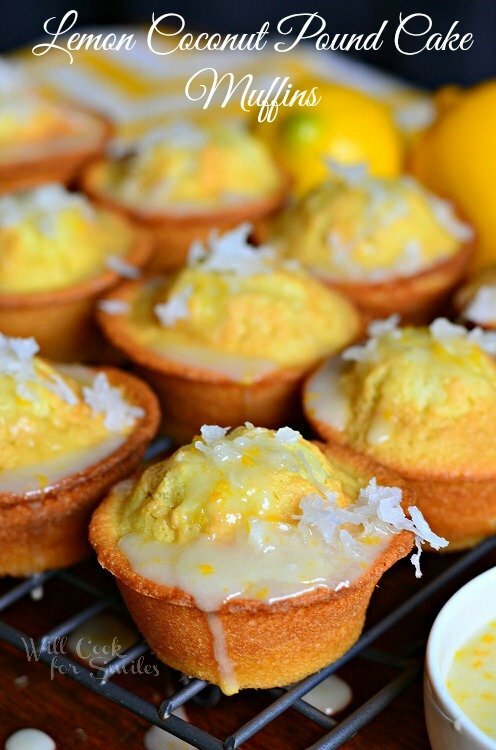 This looks fabulous, but at what temperature do I bake it at? Oh goodness, thank you for letting me know! Bake it at 400. The only ingredient showing on the list is the baguette–there must be more? Looks divine but the ingredients are missing except for the baguette. I just printed this recipe, but it is missing the type and amount of bread in the ingredients. Could you please update the recipe to include the baking temp and bread? Thank you! I can’t wait to try this. I’m so sorry, Quincy! I have a coding issue and when I fixed it, it took off the first like. It calls for 1½ French Baguette. Sorry again! Am I the only one to see that the whole idea of drinking Silk is because you have gone lactose free? 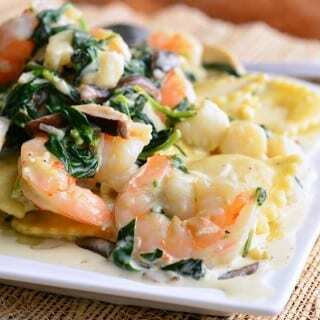 This recipe calls for a ton of BUTTER! Time to get Bach to the drawing board. 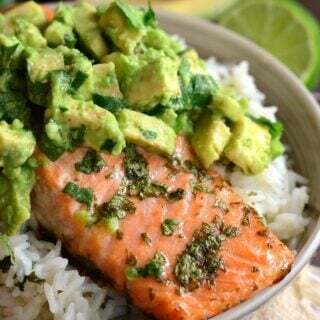 The recipe looks delicious. But I don’t see the type or amount of bread listed in the ingredients. The ingredient list doesnt include the type or amount of bread. 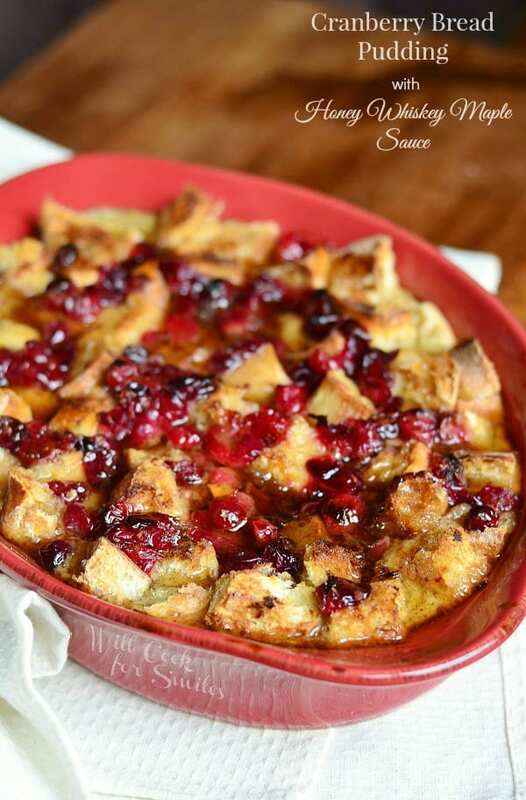 Am going to make your cranberry bread pudding with honey whiskey sauce…..where do you find honey-whiskey?! I found honey whiskey at a liquor store. It’s actually made by several brands. If you can’t find it, just use regular whiskey and add a tablespoon of honey. 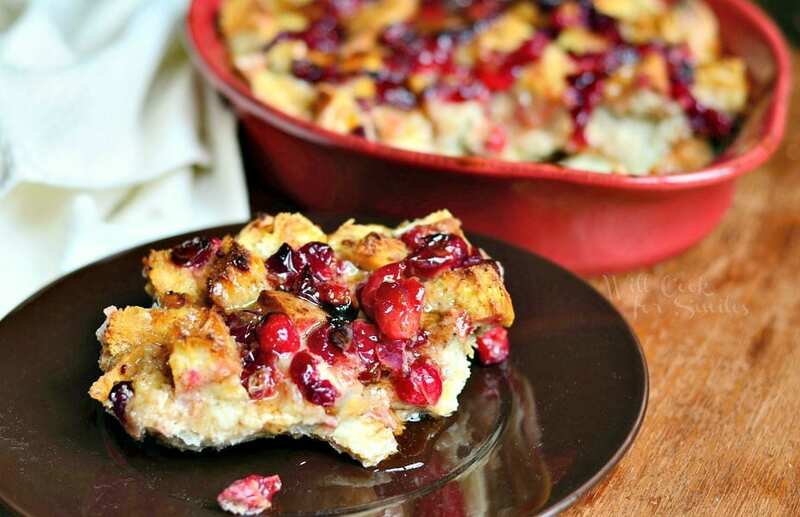 This Cranberry Bread Pudding looks soooo delicious and so tasty. Can’t wait to try it! I hope you will, Maggie ! Let me know when you do!